Chris Wood celebrates his second goal with Leeds United team-mate Souleymane Doukara. Another double from top scorer Chris Wood saw Leeds United to a massive 2-0 home victory over top two team Brighton. Garry Monk’s men made it seven games unbeaten and kept another clean sheet despite the absence of first choice defenders Pontus Jansson and Luke Ayling. 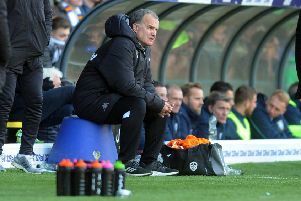 The value of the victory could be seen as it took the Whites eight points clear of seventh-placed Fulham with eight games to go in the EFL Championship. It also kept alive their outside chances of a top two automatic promotion spot with leaders Newcastle also only drawing. In fact United were one of only two teams in the top seven to win over the weekend, but head coach Monk is still keeping a lid on the excitement, although he was delighted with the display. He said: “We were very focused on the three points tonight and that’s what we will continue to do. “The reason we have been successful is that we have focused on the next game. “We haven’t guaranteed ourselves anything yet and we are taking it step by step. “Going into an international week with three points against such a top side is fantastic. “We delivered an excellent performance from start to finish and we have to remind ourselves we were up against a really top side. I think we pushed our level in this game. “You have to defend against a good side like Brighton, but I thought we did that really well. “I find it hard to single anyone out, every player played their part. Leeds started slowly in their big test against a Brighton team they have struggled against in recent years and it took them 22 minutes to have their first effort on goal, a Kyle Bartley header going wide from a Pablo Hernandez corner. Hernandez had an angled free-kick blocked soon after and his low cross almost got to Wood only for visiting defender Uwe Hunemeier to get a last ditch block. The resulting corner just evaded Wood and Brighton were relieved to survive their first serious pressure of the game. The visitors were hardly seen in attack in the opening half-hour, but Leeds were grateful to a fine save from Rob Green as he kept out a cross that was deflected towards his own goal by Liam Cooper. The rebound was then superbly headed away under pressure by Gaetano Berardi. Wood went down in the box with the home crowd baying for a penalty, but referee Lee Mason turned down the huge appeal. Overall, although Leeds were really battling all over the pitch, it was no surprise, however, that it was goalless at the break. The pace of the game picked up after the break with both sides wasting good opportunities with poor final passes. Jiri Skalak had the game’s first on target shot with a low 25-yarder that was easily collected by Green. Beram Kayal fired another long range effort wide three minutes later. Leeds’ first effort on target in more than a game-and-a-half saw the ball fall surprisingly for Wood in the box from Berardi’s cross, but his shot was too close to Brighton keeper David Stockdale. Wood made no mistake on 64 minutes when Charlie Taylor made a superb burst down the left flank and picked the New Zealand striker out with a great cross. Although left unmarked it was not an easy chance as he was a fair way out, but Wood sent a clever looping header over Stockdale into the net for the crucial opening goal. Brighton looked to hit back straight away and Sam Baldock came within inches of getting on the end of a near post flick on from a corner. Alfonso Pedraza sent a 25-yard shot over as United reminded their opponents that they could still be dangerous. Brighton then had their best spell of the game as Anthony Knockaert and Glenn Murray both had shots saved by Green and Murray sent another effort just wide. But Leeds rode out the storm and sealed their win when substitute Souleymane Doukara went on a fantastic run into the box and was brought down by Fikayo Tomori. The referee pointed to the spot and Wood stepped up confidently to score his second of the evening and 27th of his memorable season. Leeds: Green, Berardi, Bartley, Cooper, Taylor, Bridcutt, Vieira, Sacko (Dallas 81), Hernandez (O’Kane 88), Pedraza (Doukara 74), Wood. Brighton: Stockdale, Tomori, Dunk, Hunemeier, Rosenior, Knockaert, Kayal (Norwood 83), Stephens, Skalak (March 70), Baldock (Akpom 74), Murray.